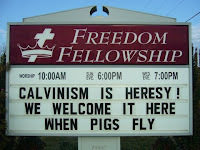 So, numerous churches in our area appreciate the not-so-subtle power of the marquee. The whole medium is lost on me, but hey, I though the ipod would be a bust. A friend at church told me about this one, and I had to go see it for myself. This was just too good. The irony … Continue reading "Strange Sightings and a Contest"